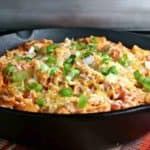 This versatile recipe for Easy Enchilada Skillet that I first shared over at The Weary Chef can be on your dinner table in just 30 minutes and can be made with either chicken or beef. I know what it’s like to be a working mom with a busy career and schedules to coordinate for busy kids. I also know how easy it is to get sucked into picking up fast food for those busy weeknights, and also how fast food meals can get old really fast. Are you with me on this?Whew! 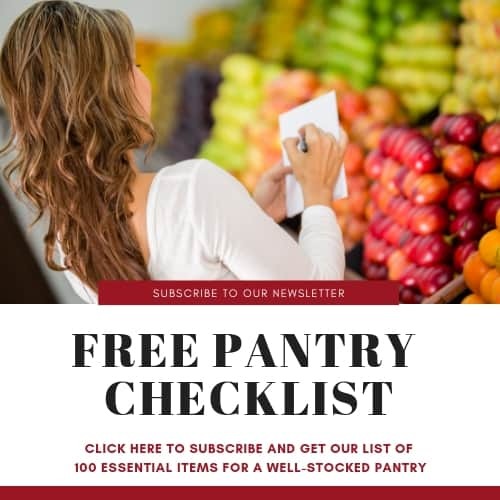 Despite all that busyness, I believe it’s really important to make the effort to have home-cooked meals as often as possible, but that doesn’t mean you have to spend hours in the kitchen. 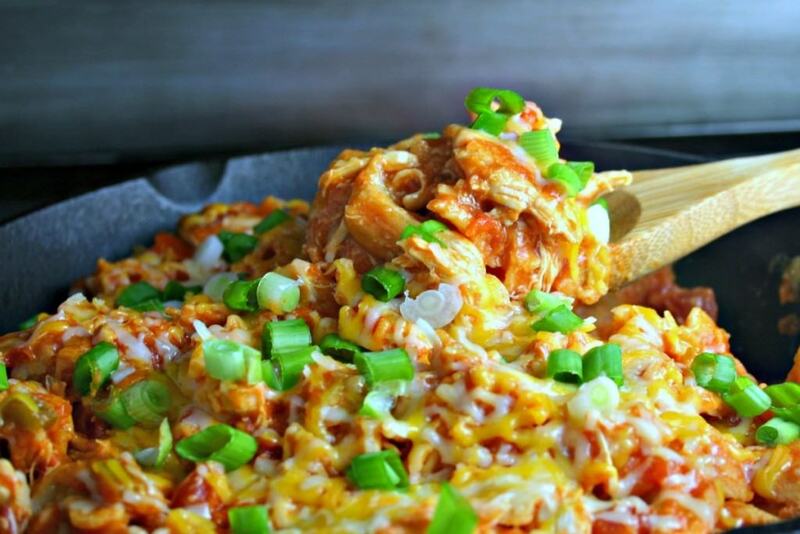 That’s why I’m excited to share with you busy moms a recipe for this EASY Enchilada Skillet, with options for either chicken or beef, that can be ready and on your table in less than 30 minutes! I love all kinds of Mexican food, and I especially love enchiladas, but they can be a bit time consuming to prepare by the time you make the sauce, cook the filling, stuff and role the tortillas, and then bake for 30-40 minutes. With this recipe, you get all the flavor in just half the time and in a single skillet — that’s a big bonus for me! 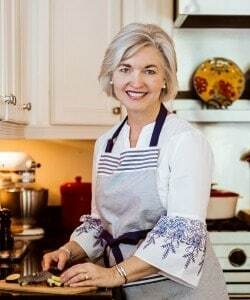 This recipe can be easily adapted for either chicken or beef and can be adjusted for your family’s “heat index” by using either HOT or MILD canned tomatoes and green chilies. Don’t be afraid to experiment with the recipe by adding jalapeños, black beans, or whole kernel corn. For my family, I like tossing in a few black beans for the beef version, but it’s totally optional with this dish. 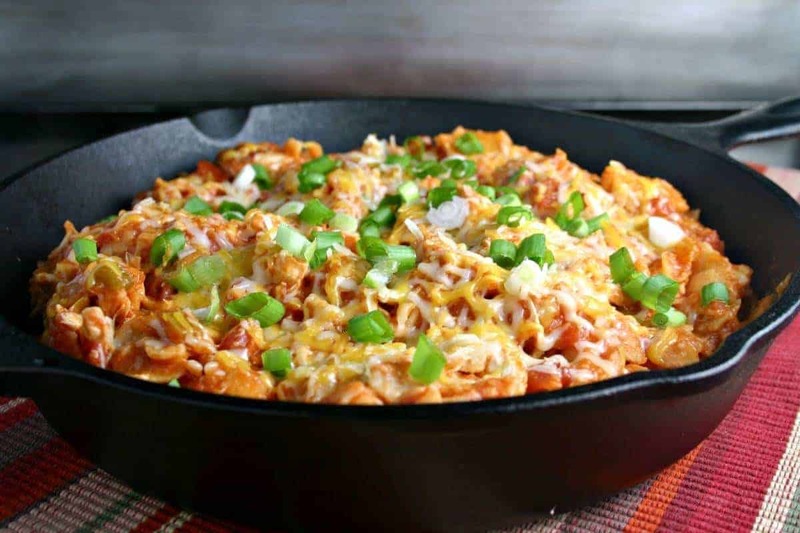 We like serving the Easy Enchilada Skillet topped with extra cheese, a dollop of sour cream, and salsa. To complete the meal, add a side of Mexican rice or chips and your favorite salsa. On your dinner table in just 30 minutes! 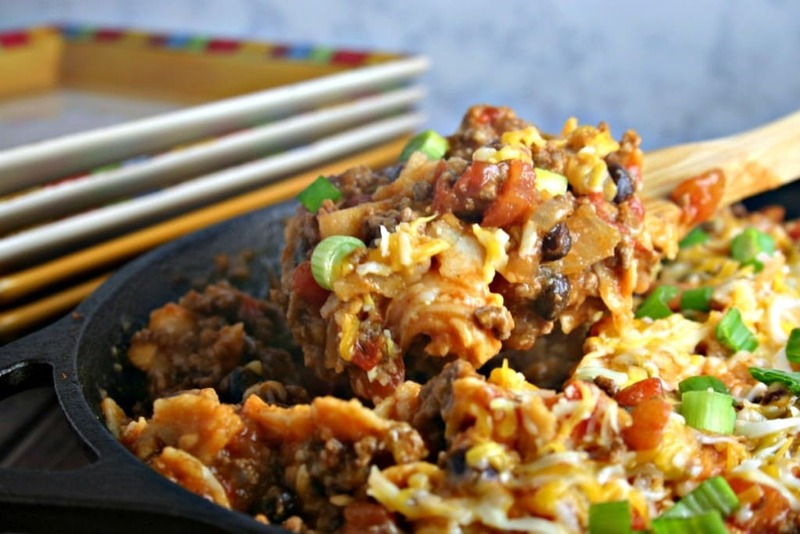 Easy Enchilada Skillet is a versatile recipe that can be made with chicken or beef! For the BEEF version, add ground beef and chopped onion and cook and stir over medium hight heat until meat is no longer pink. Drain on a paper-towel lined plate. Pour off any grease from skillet and wipe clean. Return the beef mixture to the skillet and add the torn tortillas and black beans, stirring to mix well. Cover skillet and cook over medium heat for about five minutes, stirring often. For the CHICKEN version, add chicken and tortillas to the skillet and stir to mix well. Cover skillet and cook over medium heat for about five minutes, stirring often. For BOTH versions, add the tomatoes, enchilada sauce, and tomato sauce to the meat mixture and mix well. Sprinkle with 1/2 the cheese and cover with a tight fitting lid. Cook five more minutes or until hot. Sprinkle with remaining cheese and sliced green onions and serve immediately.